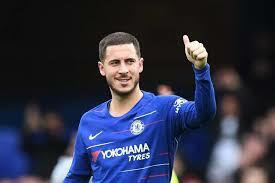 Real are understood to be confident of signing the Belgium international this summer, and Hazard has previously stated it has been his “dream” to play for the European champions since he was a child. Terreur believes Hazard has given Real hope of signing him at the end of the season, explaining: “It’s always been his dream to play for Real Madrid, and at the moment for him, it’s between Chelsea and Real. “It [is] now or never for him in my eyes. He’s 28, he’s played seven years for Chelsea now. If he wants to have another challenge, it’s now for him. He said: “They will definitely try to get the maximum out of the deal. They took a huge risk when the player has one year left on his contract. “If they force him to stay one more season, he’s free at the end of next season and Real might not be interested anymore. Then he may have to choose another English club. Hazard has made no secret of the fact Zidane was his hero when he was growing up, and Terreur said: “He was always copying Zinedine Zidane as a kid, so he has inspired him.